As already mentioned, construction of embankments are the only structural measures available with the Irrigation Department to give relief to the people from the menace of flood. In the North Bengal areas, Chengmari-Premgunj Embankment and Bibigunj-Jharsingeswar Embankment, Helapakri Embankment with extension upto Indo-Bangladesh borders on the river Teesta, Dharaikuri Embankment, and Giriya Embankment on the river Jaldhaka exist. In the southern part, the Ajoy Left Embankment on river Ajoy upto Railway line and on both the right and left embankment upto Nutanhat, construction of marginal embankments in Kaliachak and Manikchak on river Ganga, circuit embankment at Bhutnidiara and embankments on the upper reaches of Dwarka, Brahmani and Mayurakshi System have been taken up during this period. Some of the important embankments of this region are the Bhagirathi embankment from Bhagirathi to Palassey and the Ganges embankment. The Department has made some remarkable advancements renovating embankments in flood control sector by taking up remodelling and strengthening of its existing embankments ravaged by 1999 and 2000 flood with HUDCO and NABARD loan. 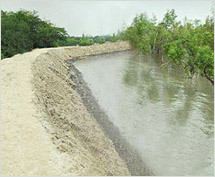 The embankments of the Kangsabati Systems have been raised and strengthened under NABARD loan. 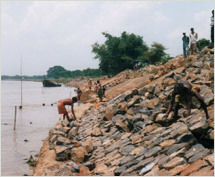 The embankments of the Mayurakshi-Bhagirathi System have been reconstructed and rebuilt in many places. A remarkable achievement in flood fighting and flood damage repair works is that at every step the Department is now working with the people at the grass root level through PRIs in the perspective of decentralised planning. Very recently in 2001 GFCC has given technical clearance to the Nabadwip Town Protection Works and it awaits the clearance of the Planning Commission. Located on the southern most fringe of the State of West Bengal, the Sundarbans present a complex model of ecological co-existence of diverse aspects in close inter-action with one another. The Sundarbans is pre dominantly a deltaic region formed mainly by the continuous deposition of silt carried down the Ganga-Bhagirathi-Hooghly river system, in the delta building activity. New formation in the Sundarbans delta is now entirely dependent on tides. High fertility of soil and proximity to Kolkata attracted some adventurous people under the patronage of the then Collector General of East India Company, Mr. C. Russell to start cultivation in the Matla-Bidyadhari spill areas east to Kolkata in 1770 through the construction of circuit embankments to protect these areas against the ingress of saline tidal water. Prior to this the entire area was under forests. In fact, the northern boundary of this forest came to be identified for the first time as the Dampier – Hodge’s line when the survey work started by Mr. Ensign Princep in 1922 was completed in 1830 when Mr. William Dampier was Commissioner and Lt. Hodges was the Surveyor of the Sundarbans Commission. The history of settlement in the Sundarbans dates back to late 18th century continued steadily – an activity, which introduced the initial dimension of complexity due to human interference on the prevailing natural scenario of the areal ecology. Encouraged by increasing food production, this process of premature reclamation of lands continued unabated through the Zamindary system under the British Regime which ultimately encompassed a substantial area of the Sundarbans except the areas demarcated as reserved forests only. After Independence, the Zamindary System was abolished and the unenviable task of maintaining this extensive system of Zamindary embankments devolved on the State Government and was eventually transferred to the State Irrigation and Waterways Department in the year 1960. 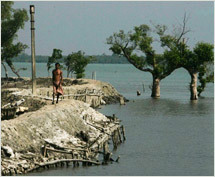 The Sundarbans comprises an area of 7910 sq. km. (3089 sq. miles) out of which 4170 sq. km. (1629 sq. miles) are under reserved forest including creeks, channels and rivers within Forest Zone. Out of remaining 3740 sq. km. (1460 sq. miles) recovered from forest about 2590 sq. km. i.e. about 0.259 Million Hectares (1000 sq. miles) are under cultivation which are now protected by about 3500 kilometers of marginal embankments. Out of the remaining 1150 sq. km. (460 sq. miles) within non-Forest habitable zone, 891 sq. km. (360 sq. miles) is water surface and balance 259 sq. km. (100 sq. miles) is unhabited foreshore land or low newly formed islands. The maintenance of embankments and providing drainage facilities to the embanked areas through construction of sluices are in general looked after by the Irrigation Department through the Eastern Circle of the I&W Directorate. A project titled "Urgent Development Works of Sundarbans" has been framed to upgrade and strengthen properly the embankments and provide adequate drainage.